La Serena Aperitif has bright pomegranate hues, with an abundance of rich nougat and nut flavours. Only 1400 La Serena was bottled. 100% Muscat De Hambourg fortified with a 7 year potstill brandy. 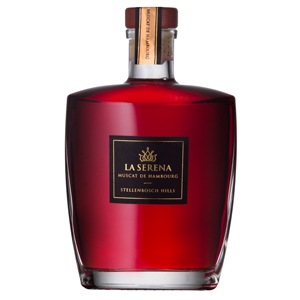 Stellenbosch Hills La Serena Aperitif has bright pomegranate hues, with an abundance of rich nougat and nut flavours, complemented by whiffs of rose petals. Serve cold on crushed ice, as a cocktail or with dessert or a cheese platter. Grapes were fermented on the skins in 300 litre open top barriques for seven days after which the juice was fortified with a seven year old potstill brandy at 12ºB.